In order to remain safe and beautiful, pools require chemicals. However, using these chemicals can seem daunting at first, especially given all of the safety labels on some of them. It can also be daunting trying to figure out which chemicals you need and when to add them. What Swimming Pool Chemicals Do You Need? Every pool needs a sanitizing agent. These keep the water free of bacterial contamination that could make bathers sick. pH and alkalinity balancing compounds ensure that levels are within a range where the sanitizing chemicals are most effective. Sanitizers, pH, and alkalinity adjusters are the basic, required chemicals. Sanitizing agents should be present in the pool at all times. However, chlorine (or bromine) gets bound to particles in the water as it does its job. This is why testing is done for free chlorine levels because this is what is available to continue providing sanitization. Pool shocking chemicals are used to provide a temporary, super-high level of sanitizing agent in the water. Shocking chemicals break down quickly in the sun, so they are usually added in the evening and work during the night. The goal is to raise the chlorine levels high enough so that all of the bound chlorine and microorganisms can be destroyed. What Chemical Levels Should You Aim For? In order to be safe and effective, pool chemicals should be maintained within a certain range. Chlorine testing ensures that the amount of sanitizing chemical in the pool is correct. pH and alkalinity testing ensure that these parameters are within a certain effective range. 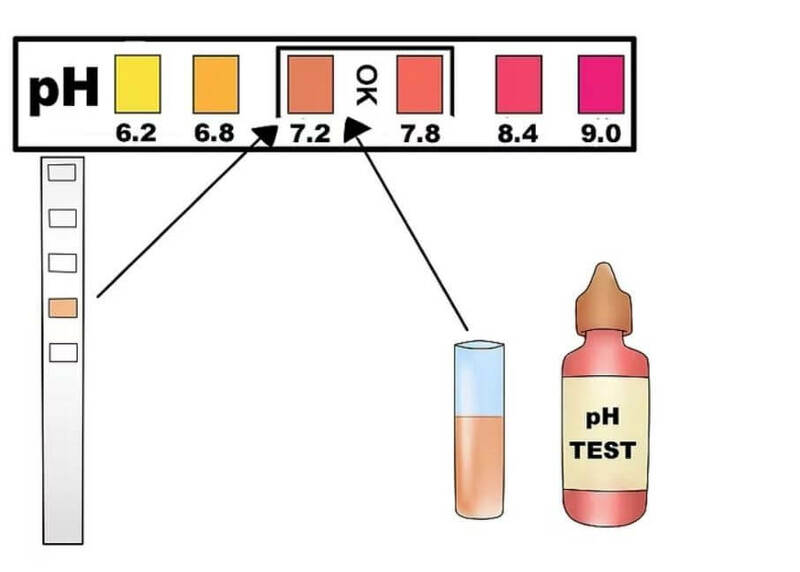 Here is a good visual from WikiHow on how your pH tester will look at the right level. Make sure your pool is right in the middle of that orange and coral range. Ideally, you want to be between 7.4 and 7.6, but anywhere between 7.2 and 7.8 is typically just fine. The sanitizing agents, pH and alkalinity affect each other and need to be maintained within a given range. Proper calcium hardness prevents the water from leaching calcium from your pool walls if the levels are too low, or depositing calcium scale on your pool walls if the levels are too high. How Often Should You Check Your Pool Water? Pool water parameters are dynamic. They change based on swimmer load, sunlight, weather, and other factors. Because of this, checking your pool water regularly is important if you want to keep the parameters in line. Most recommendations are to test at least three times a week. Shocking agents should be used about once a week no matter what readings you get when you test the water. However, it is important to balance the water before you add the shock. If you don’t, it may not work as well. Because water parameters are so dependent on the outside world, recommendations for how often to test and how often to shock are variable. In general, if the pool gets a lot of use, testing and shocking more often may be necessary. Bather contributions such as sunscreen and skin oils contribute significantly to changes in water chemistry. Are Swimming Pool Chemicals Safe? The goal of pool chemicals is to keep the water safe. When used as directed, pool chemicals are safe. This does not mean that the concentrated forms are safe, however. Always follow safety instructions when handling pool chemicals, and do not swim in a pool that has just been shocked. The safety instructions on the pool shock will tell you how long you should stay out of the water. One mistake that people make is thinking that a heavy chlorine smell or eye and skin irritation from the pool means the chlorine levels are too high. Actually, these are both signs of high chloramine levels, which is the bound form of chlorine. Shocking the pool should help in both of these cases. Hopefully we’ve reduced some confusion you may have had around swimming pool chemicals. Til next time!